Saisho electric Jug S-402 will help you boil water anytime you need. It is very fast and energy efficient, it takes few minutes to boil water. This is an essential kitchen appliance for every home, as it allows you to grab a cup of tea while getting ready for work or a cup of coffee in the office between meetings. It has a detachable cord which makes it easy to store up. It has been designed in a way that water does not spill from the jug; it is possible with the help of a non-spill spout of the jug. This jug allows you to do plenty task at a time, as you will be able to make tea and do other tasks at the same time. This Saisho electric jug gets its efficiency from the immersed heating element put in it. Once the water has reached its boiling point, it automatically shut off, thus helping you save a lot on energy consumption. Save your cooking gas, kerosene and time by boiling water quickly with Saisho electric jug. It has an aesthetic design that will enhance the look of your kitchen. The material used to make this jug, makes it durable and you will be able to get great value for your money. This electric hot plate by Saisho is ideal for making meals, or keeping them warm. You can make fast lunch in your kitchen or cubicle or heat up a fast food anytime. The portable Saisho Electric Hot Plate is easy to use and can be used to prepare all kinds of food. Unlike other hot plates, this hot plate has been well covered to prevent any form of electric shock. The body is well coated to protect it from rust and other thing that will not allow you get value for your money. This compact hot plate will keep your kitchen clean without leaving any black soot. It is better than cooking with stove and other traditional methods. The Nexus Steam Iron is an effective home appliance which allows you to look smart every day. It helps iron out crease in clothing using its steam spray burst. It features a non-stick flat sole plate which enables it deliver best result at all times. Additionally, it comes with a transparent water tank which allows for proper monitoring of the water. The Nexus Steam Iron has temperature control so you can regulate the heat when ironing different clothing. Furthermore, its auto-off feature ensures the clothes do not get burnt. 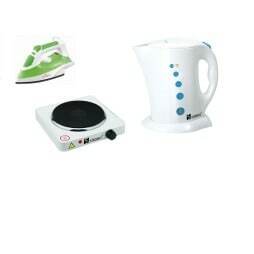 It has a long cord and an ergonomic design which makes ironing easy and fun. The Nexus Steam Iron has both spray and steam feature so you are sure of achieving well-ironed clothes in quick time. With the spray feature, you get to moisten your cloth which makes the ironing less stressful. The burst of steam helps to tackle every form of wrinkle on clothes. The Nexus Steam Iron is not too heavy so handling will not be an issue. There will be no need to apply too much pressure when ironing. You can apply starch to your shirts and be sure of impressive result since it combines heat and steam to penetrate deep into the fabric of clothes.